The MPDS application programming interface (API) presents the materials data of the PAULING FILE database online in the machine-readable formats, suitable for automated processing. The intended audience of this API is software engineers and data scientists. The API is available by a subscription (SLA). To start using the API the reader needs a valid API key from the MPDS account. We encourage to contact us for opening such the account. Some parts of data are opened and freely available. In particular, these are: (a) cell parameters - temperature diagrams and cell parameters - pressure diagrams, (b) all data for compounds containing both Ag and K, (c) all data for binary compounds of oxygen, and (d) all data generated via machine learning. Please, login via GitHub to get the API access to these data. A tech-savvy reader may also explore Jupyter notebooks (also in Binder) and kickoff Python demos. Important: using the API keys within the third-party environment like Binder is potentially insecure and should be done with the greatest care. The standard unit of the MPDS data is an entry. All the MPDS entries are subdivided into three kinds: crystalline structures, physical properties, and phase diagrams. They are called S-, P- or C-entries, correspondingly. Entries have persistent identifiers (analogous to DOIs), e.g. S377634, P600028, C100027. Another dimension of the MPDS data is the distinct phases. The three kinds of entries are interlinked via the distinct materials phases they belong. A tremendous work was done by PAULING FILE in the past 20 years to manually distinguish more than 100 000 inorganic materials phases, appearing in the literature. Each phase has a unique combination of (a) chemical formula, (b) space group, (c) Pearson symbol. Each phase has an integer identifier called phase_id. Consider the following example of the entries and distinct phases. There can be the following distinct phases for the titanium dioxide: rutile with the space group 136 (let us say, phase_id 1), anatase with the space group 141 (phase_id 2), and brookite with the space group 61 (phase_id 3). So then the S- and P-entries for the titanium dioxide must refer to either 1, or 2, or 3, and C-entries must refer to 1, 2, and 3 simultaneously. Our new development is the machine-learning data generated from the original peer-reviewed data for the less known phases. Such data are always clearly attributed and not supplied by default. So far only the P-entries (8 physical properties) were predicted and thus can be of the machine-learning data type. See below how to allow these data in the API outputs. Table 1. Categories of MPDS data. Thus, in an API request it is possible to combine all these criteria in a reasonable manner. Combination is always done implying conjunctive AND operator. The reasonable manner means one can combine e.g. publication authors with publication years, but cannot combine chemical formulae with chemical elements or space group with crystal system, i.e. the common sense rules are implied. We distinguish the single-term categories, such as the physical properties and crystal systems, and many-term categories, such as the materials classes and publication authors. A combination of terms from the single-term category is not supported. That is, one cannot search for both band gap and conductivity. A combination of terms from the many-term category is easily possible. That is, one can search for both binaries and perovskites. q JSON-serialized object The object q may contain any reasonable combination of criteria, given in the Table 1, column "Machine-readable name". Always required. phases string or integer Distinct phase identifiers (called phase_id's) separated by commas can be optionally supplied to limit the search. This is convenient for programmatic chained searches. A relevant q parameter must be always given. The count of phase_id's cannot exceed 1000.
dtype integer Data type. Possible values: 1 or MPDSDataTypes.PEER_REVIEWED (original data), 2 or MPDSDataTypes.MACHINE_LEARNING (data generated via machine learning), and 7 or MPDSDataTypes.ALL (both mentioned types). Default value: 1 (original data). pagesize integer The maximum number of hits per a single response (pagination). Default value: 10. Allowed values: 10, 100, 500, and 1000.
page integer The page number, either in the selected or in the default pagination. Counts from 0. Defaults to the first page, which has number 0, i.e. the default value is 0.
fmt integer Output data format. Can be json or cif. The latter cif only makes sense for crystalline structures. Default value: json. Table 2. Query string parameters for download endpoint. By default the response has json format, containing the following properties: out (list i.e. array of the MPDS entries), npages (number of pages in the selected or default pagination), page (current page number), count (total number of hits), and error (should be null). Some other properties might be added in future. Each kind of entries (i.e. S- or P-entries) has its own specific properties in JSON (see below). The output in cif format presents nothing more than concatenated CIFs in a plain text. The response for a correctly understood request will always have the status code 200, whereas the status codes 400 ("Wrong parameters") or 403 ("Forbidden") may signal about an error in the request. Also, 429 ("Too many requests") tells that the request rate should be decreased. Generally, checking the response status code should be always done first. Listing 1. Interactive JSON schema for crystalline structure or S-entry (objects are clickable). Listing 2. Interactive JSON schema for physical property or P-entry (objects are clickable). Listing 3. Interactive JSON schema for phase diagram or C-entry (objects are clickable). Listing 4. Python console script for JSON validation. All the MPDS data are expected to be valid against the supplied schemata. # NB 400 means wrong input, 403 means authorization issue etc. Listing 5. Sample Python script for working with MPDS API. // NB 400 means wrong input, 403 means authorization issue etc. The MPDS data provided in API and GUI (graphical user interface) are generally the same. There are however two important points to consider. First, the GUI is intended for the human researchers, not for the automated processing. Therefore the data in GUI are less rigorously formatted, being thus closer to the original publications (which, of course, impedes machine analysis). Second, some portion of data (~15%) present in the GUI is absent in the API. This is because currently a number of MPDS entries has only textual content or even no content at all (in process of preparation), i.e. present little value for the data mining. However, we make our best to expose the maximum MPDS data in the API, and this is the work in progress. To summarize, the API differs from GUI in the following: (a) machine-readable (and to a certain extent machine-understandable), (b) programmer-friendly, pluggable and integration-ready, (c) massively exposing the data, i.e. all the MPDS content can be analyzed in minutes. Thus, thanks to the API, the MPDS platform can be used in variety of the other scientific ways, which we had never designed. So the researchers get unprecedented flexibility and power, which is unthinkable within the GUI. To facilitate starting with the MPDS API we provide several exercises (or miniature case studies): (a) distribution density analysis, (b) clustering, and (c) correlation search. To a certain extent they could be considered as recipes, however aiming to illustrate the informatics aspect, not the materials science aspect. All these exercises are described below and can be found in the Github repository. There is also a number of Jupyter notebooks: (a) basic plotting using the periodic table, (b) machine-learning and peer-reviewed data, (c) unusual materials phases from the machine learning, (d) pVT-data and EoS fitting. They can be launched online from GitHub using e.g. Binder environment. The reader now may decide, whether to follow a text with the code listings below ("classical way"), or to download and run the Python scripts ("Python way"), or play with the Jupyter notebooks interactively online ("ultra-modern way"). Important: using the API keys within the third-party Jupyter environment is potentially insecure and should be done with the great care (see notebooks). In fact, the data type is controlled by a client with the dtype query string parameter. The MPDSDataRetrieval.compile_crystal API client method helps us to handle the crystalline structure in the ase's Atoms flavor. A popular Pymatgen library can be also used instead. Mind however that these two libraries are generally incompatible, so never mix crystalline structures in ase and Pymatgen flavors. That runs a little bit slow (about five minutes), since ase's Atoms are expectedly not performing very well on dozens of thousands of bond length calculations. We may want to employ a C-extension here, but this is outside the scope of this exercise. Anyway now we have a flat list lengths. Let's convert it into a Pandas Dataframe and find which U-O distances occur more often than the others. Fig. 1. Distribution of U-O bond lengths across MPDS database. We can see now that the most frequent bond lengths between the neighboring uranium and oxygen atoms are 1.78 and 2.35 Å. This excellently agrees with the well-known study of Burns et al., done in 1997. However, Burns considered only 105 structures, and we did more than 2500, confirming very well although his findings on the uranyl ion geometry. Unsupervised grouping the values into the clusters in a many-dimensional space is a classical mathematical problem. In an applied data science it is successfully managed using e.g. such algorithms as k-means and Gaussian mixtures. Taking the non-conducting binary compounds, let us find the clusters in their band gaps and the periodic groups of their elements. That is, we obtain the band gaps and corresponding pairs of the chemical elements, forming a binary compound, and then, for the series of values group of the first element — group of the second element — band gap we apply k-means. Given a set of points (in our case, in a three-dimensional space), k-means aims to partition the points into a number of sets, in order to minimize the within-cluster sum of distance functions of each point to the cluster center. We use a standalone k-means Python implementation kmeans, although the reader might want to employ sklearn or scipy. Note, that the k-means algorithm does not provide the number of clusters to divide our data. 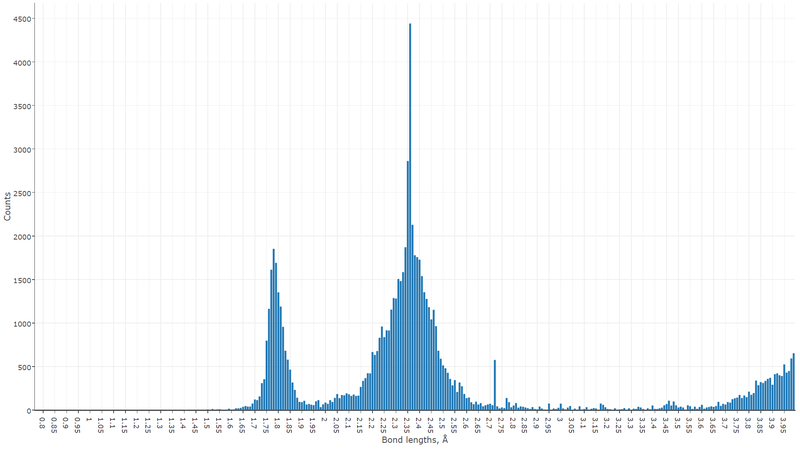 We try to guess this number from the size of our data naively using k_from_n function. For homogeneous data this guess is likely to be wrong, but for heterogeneous data it should make sense. We then export the data in a flat Python list for plotting as follows. The plot below is prepared using the visualization exporting toolbox. Fig. 2. 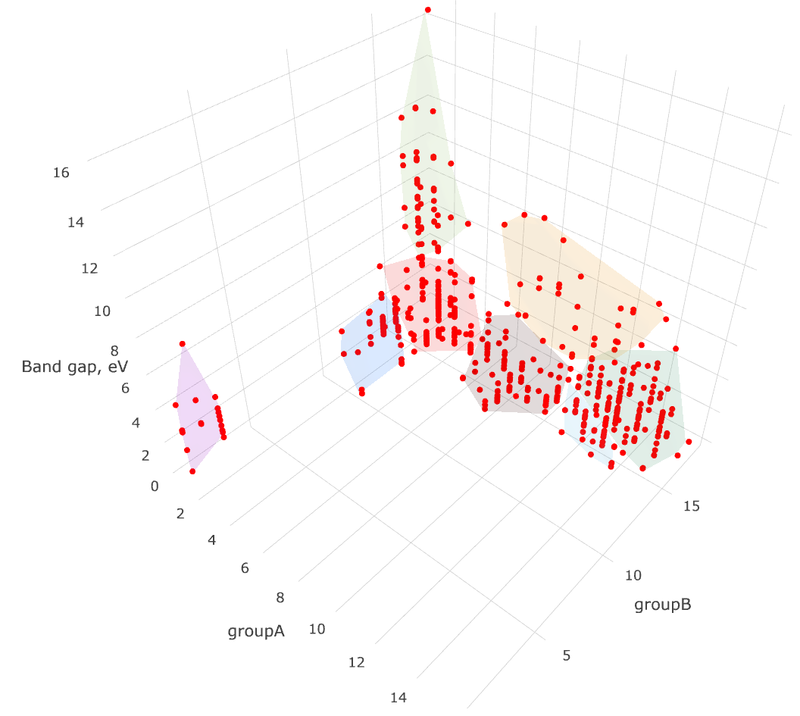 Binary compounds clustering by their band gaps and constituent element groups. In this excercise we quantitatively estimate the relationship between a physical property of interest and the atomic structure. This is the very basic task in chemoinformatics, called QSAR/QSPR study, which stands for the quantitative structure-activity or structure-property relationship modeling. Technically, we request some physical property from MPDS and try to figure out, whether it depends on the crystalline structure, and if yes, how much. Here the question "how much" is answered by a correlation coefficient, which can be defined either as a measure of how well two datasets fit on a straight line (Pearson coefficient), or difference between concordant and discordant pairs among all the possible pairs in two datasets (Kendall's tau coefficient). Both Pearson and Kendall's tau correlation coefficients are defined between -1 and +1, with 0 implying no correlation. For the Pearson coefficient, values of -1 or +1 imply an exact linear relationship. Positive correlations imply that as x increases, so does y. Negative correlations imply that as x increases, y decreases. For the Kendall's tau coefficient, values close to +1 indicate strong agreement, values close to -1 indicate strong disagreement. Calculation of both these correlation coefficients is provided by pandas Python library. We then present two descriptors for the crystalline structures. The term descriptor stands for the compact information-rich number, allowing the convenient mathematical treatment of the encoded complex data (crystalline structure, in our case). We employ an APF descriptor, as well as topological Wiener index, defined per a unit cell. It is up to the reader to check the other descriptors for the crystalline structures. Note that our descriptors generally depend on whether we use compile_crystal(item, 'ase') or compile_crystal(item, 'pmg'). This is because by default ase and Pymatgen libraries handle crystalline structures in a slightly different manner. The reader is welcomed to edit the code above for the Pymatgen library. Expectedly, we can see some correlation between the selected property (namely, isothermal bulk modulus for the oxides of transitional elements) and two structural descriptors. However it varies considerably with the different materials classes, since the crystalline structure also changes considerably. Using the intuition, may the reader suggest the physical property showing higher correlation with either of two structural descriptors within a certain materials class — or no correlation at all? Although the reader is encouraged to visualize the data using his habitual tools, we provide a set of helper utilities. Using a simple exporting toolbox in our Python client library each of the exercises considered above may output two files for the further plotting: CSV and JSON. We thank the reader for the time and interest! Any questions or feedback is very welcomed and greatly appreciated. Created by Materials Phase Data System and Tilde Materials Informatics.